This might be one of the BEST vegan pizza recipe I’ve done yet! Those of you who have been following me over the years know all too well that I am no stranger to vegan pizza. This time around it’s all about the crust! I went on my instagram and asked you guys what fast food copycat recipe you wanted next, and a vegan version of Pizza Hut’s stuffed crust was a clear winner! Indulging in a cheesy, stuffed crust Pizza Hut pizza is not something I’ve ever done, so I was SUPER excited to tackle this one and give it a try for myself. 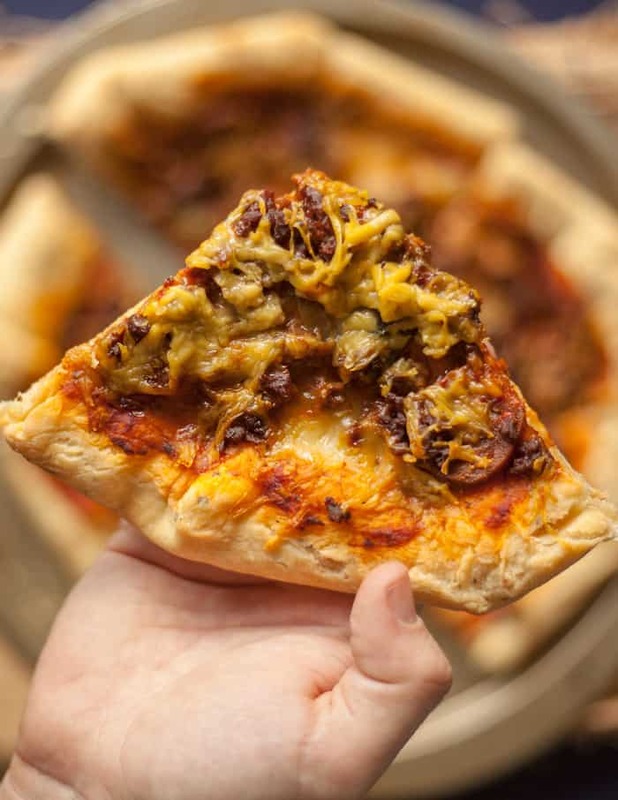 If you have missed this cheesy delight, than feel the FOMO no further, as this vegan spin on a Pizza Hut favourite is now totally obtainable, and right within the constructs of your very own kitchen. Move over Pizza Hut, The Edgy Veg Vegan Stuffed Crust Pizza is here. The ingredients for this pizza pie include grated vegan cheese, green pepper, veggie pepperoni or sausage, veggie ground round, mushrooms, olive oil, pizza dough, pizza sauce (see my pizza sauce recipe here) and of course, more vegan cheese for the stuffed crust. I also recommend using cornmeal to powder the pizza pan (if you are using one). Chili oil and vegan ranch sauce for dipping, seal the deal for a super delicious homemade pizza dinner. To assemble this pizza, start by preparing the dough for the crust. I used the one from my cookbook, but you can also use store-bought dough. Make sure your dough is room temperature. Prep all your toppings and preheat the oven to 425 degrees F with your pizza stone in the oven (if you are using one). If you’re using a pizza pan, grease it and/or sprinkle with cornmeal. Roll out your dough until it’s about two inches larger than the pizza stone or pan. Note: If you’re using a pizza stone- remove it from the oven very carefully. Put the pizza dough onto the pan or stone and poke it with a fork all over. This will prevent the dough from bubbling. If you are using a stone- move VERY quickly so that the crust does not start to cook before you’re finished pizza assembly. Place the vegan cheese sticks (or shreds if using), end to end, around the edge of the dough. Brush a small amount of water on the dough to moisten the edge all of the way around. This will act like a glue. Fold the dough over the cheese and press it down onto itself, add more water if it is not sticking. Seal it all the way around, so the cheese does not ooze out the side. Using a new brush, brush the top of the folded dough all the way around with olive oil (just the round stuffed crust edge, not the entire pizza). Spread your desired amount of pizza sauce onto the centre of the dough and brush all the way to the edge, just covering the seams along the stuffed crust. Add the other toppings, as much as you desire, and then sprinkle on the grated mozzarella to finish. Place the pizza into the oven and bake for 12 to 20 minutes or until the crust begins to turn golden brown and the cheese is melted. The timing will depend on the type of pizza pan or stone you are using. Slice the pizza and serve hot on it’s own with a side of chili oil or vegan ranch. Make the Pizza Hut famous stuffed crust pizza vegan! This vegan stuffed crust pizza recipe is the best vegan pizza I've had yet. The ingredients for this pizza pie include grated vegan cheese, green peppers, veggie pepperoni or sausage, veggie ground round, mushrooms, olive oil, pizza dough, homemade pizza sauce and of course, vegan cheese for the stuffed crust. I also recommend using cornmeal to powder the pizza pan (if you are using one). Prepare the dough for the crust. I used the one from my cookbook, but you can also use store-bought dough. Make sure your dough is room temperature. Preheat the oven to 425 degrees F with your pizza stone in the oven, if using. If you’re using a pizza pan instead, grease it and/or sprinkle with cornmeal. Roll out your dough until it's about two inches larger than the pizza stone or pan. If you’re using a pizza stone- remove it from the oven very carefully. Put the pizza dough onto the pan or stone and poke it with a fork all over. This will prevent the dough from bubbling. If you are using a stone- move VERY quickly so that the crust does not start to cook before you’re finished pizza assembly. Place the vegan cheese sticks (or shreds if using), end to end, around the edge of the dough. Brush a small amount of water on the dough to moisten the edge all of the way around. This will act like a glue. Fold the dough over the cheese and press it down onto itself, add more water if it is not sticking. Sealing it all the way around, so the cheese does not ooze out the side. Using a new brush, brush the top of the folded dough all the way around with olive oil. Just the round stuffed crust edge, not the entire pizza. Spread your desired amount of pizza sauce onto the centre of the dough and brush all the way to the edge, just covering the seams along the stuffed crust. Add the other toppings, as much as you desire, and then sprinkle on the grated mozzarella to finish. Place the pizza into the oven and bake for 12 to 20 minutes or until the crust begins to turn golden brown and the cheese is melted. The timing will depend on the type of pizza pan or stone you are using. Slice the pizza and serve hot on it’s own with a side of chili oil or vegan ranch.